Election 2019: Samajwadi Party leader Azam Khan, who was banned from campaigning for 72 hours starting April 15, found himself in fresh trouble on Tuesday after the Election Commission issued him a fresh notice for making inflammatory speeches in Uttar Pradesh. The EC, prima facie, found him guilty of violating the poll code. The central government has cancelled the business visa given to Bangladeshi actor Ferdous Ahmed and has issued a Leave India notice for allegedly campaigning for the Trinamool Congress in Bengal, officials said. Kathir Anand, son of DMK treasurer Duraimurugan, writes to EC. Anand asks EC to recall its order and restore the election in Vellore, failing which he threatens to pursue legal action claiming damages. Anand calls the raids 'stage-managed' by ruling AIADMK coalition. Three RJD leaders on Tuesday joined the ruling JD(U) in Bihar alleging that the RJD did not give due importance to the Extremely Backward Class (EBCs) in distribution of tickets for Lok Sabha elections in Bihar. The three leaders - former MP Mangni Lal Mandal, ex-MLC Ram Badan Rai and former MLA Jagat Narayan Singh - joined the JD(U) when one of the seven phases of the Lok Sabha elections has been held in the state. Election Commission appoints special observer for West Bengal, two days ahead of the second phase of polls in the state. ECI has appointed 1984 batch IAS officer Ajay Nayak as an observer. Amid Poll Panel's Gag Order, Yogi to Visit Ayodhya | Uttar Pradesh Chief Minister Yogi Adityanath will visit the Ram Lalla temple in Ayodhya on Wednesday, amid the 72-hour ban on campaigning imposed on him by the Election Commission. 1.5 lakh cash seized from a vehicle in Karimganj, Assam. Driver of the vehicle has been detained while one person managed to escape. Kanimozhi: These incidents only strongly confirm that Modi is using EC to threaten us. We will not be cowed down by these incidents. We will emerge victorious. The ruling party is scared of our victory. They are carrying out raids to tarnish the image of DMK. Kanimozhi: I feel they are conducting searches because I am the candidate of the opposition. The EC officials accepted that there is no cash in my house. Also, no documents were seized. Tamilisia has parked several crores of rupees in her residence. Is the EC ready to conduct searches there? DMK will not be perturbed by these incidents. We will fight against these forces. Kanimozhi: At 8:30pm, I-T officials asked permission to conduct searches at my residence. I quesioned if they have requisite warrant to conduct searches. But they did not have proper answer. Despite that, we fully coordinated with the agency. I was issued summons at 9:30 pm and was asked me to record a statement at the spot. According to my knowledge, this is not legal. An Election Commission flying squad reached AMMK's office in Theni after receiving information of the money being hoarded. 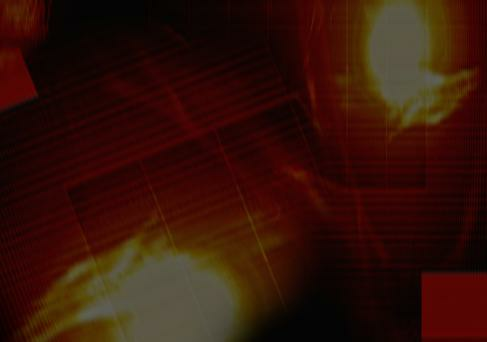 The officials were then held captive by the party's cadre, which prompted the police to fire four rounds in the air. Officials Held Captive by Party Members | A standoff has ensued between the cadre of TTV Dhinakaran-led AMMK and the police as officials attempted to search for stashed cash on the party's office premises. Elections Deferred Over Law and Order Concerns | Elections in Tripura East, which was slated to go to the polls on April 18, have been deferred to April 23 over law and order concerns. The team of I-T officials and static surveillance team of the Election Commission has stopped the raids at Kanimozhi's residence. Nothing was seized so far. Twelve candidates, including 10 from unrecognised parties, filed their nominations Tuesday for the Lok Sabha polls in Delhi scheduled for May 12. Two independent candidates also filed their nominations, which began on Tuesday, for parliamentary elections. Union Minister Jitendra Singh has accused the Congress of resorting to "anti-India and anti-Army rhetoric" out of insecurity. "Congress, its allies and all those political parties and leaders who have ganged up against the BJP and Modi, are feeling so insecure that they have resorted to anti-India and anti-Army rhetoric," Singh said. FIR Lodged Against Navjot Sidhu For Violating Model Code | An FIR has been lodged against Navjot Singh Sidhu in Katihar, Bihar on charges of violating the Model Code of Conduct (MCC) during his speech at a rally earlier today. The Congress MLA sparked controversy for appealing to Muslim voters to vote as a bloc against the BJP. EC Asks Azam Khan to Respond Within 24 Hours | Meanwhile, the Election Commission has served another notice to Samajwadi Party's Azam Khan a day after the poll watchdog barred the veteran leader from campaigning for 72 hours. In its notice, the EC said that the remarks the leader made during various rallies across Rampur district were "derogatory and provocative" and were in violation of the Model Code of Conduct. In a further escalation, MK Stalin says that "Prime Minister Modi is using the Election Commission to deliberately target the DMK." DMK president MK Stalin hits out at the Election Commission over the raids at Kanimozhi's residence. "Tamiliasai Soundarrajan has several crores of money at her residence. Why are there no raids at her place? Despite a proper complaint to the EC no action has been taken," he says while calling for reforms in the poll body. Tamilsai Soundararajan is the BJP candidate contesting against Kanimozhi from Thoothukudi, which will head to the polls on April 18. Kanimozhi's Tuticorin Residence Raided by I-T Dept | DMK leader Kanimozhi is the latest in the list of political leaders to come under the I-T department's scanner. A team from the government agency has raided Kanimozhi's Thoothukudi residence. 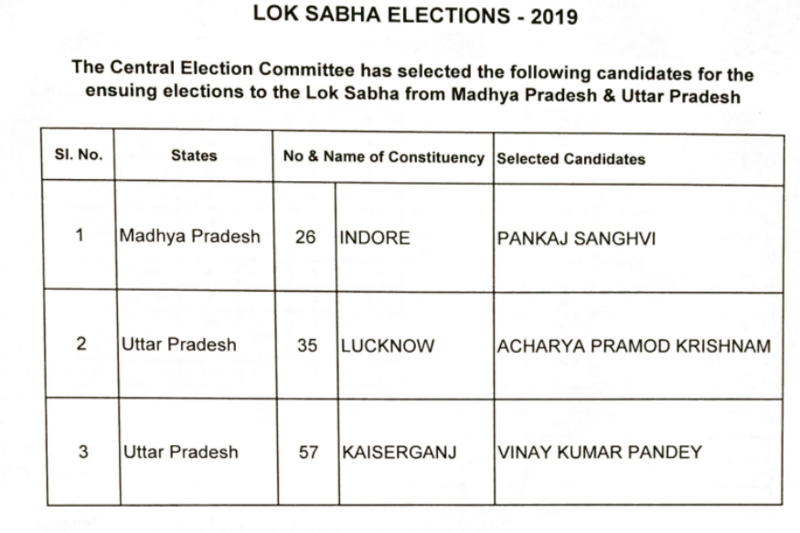 Cong Names Lucknow Candidate in New List | Hours after Samajwadi Party requested Congress to not field candidates from Uttar Pradesh's Lucknow seat, the party has announced the name of Acharya Pramod Krishnam as its candidate from the constituency. The SP had requested the grand old party to refrain from contesting on the seat to "ensure a victory over the BJP" following the joining of Shatrughan Sinha's wife Poonam Sinha, who is being fielded by Akhilesh Yadav's party. FIR Lodged Against UPL Days After Raids | An FIR has been lodged against United Phosphorus Limited for preparing illegal campaign material for the BJP in Khar area of North-West Mumbai. Last week, Maharashtra Pradesh Congress Committee general secretary and spokesperson Sachin Sawant accused the BJP over its alleged collaboration with the company. In the April 9 raid that was led by Sachin Sawant and Election Commission, illegal material worth 6 crores was found after which the office of UPL was sealed. Three-time Asom Gana Parishad MLA from Jagiroad, Bubul Das joined the Congress today. Das had quit the party on Monday in protest against its alliance with the BJP. The bye-elections in the two Assembly segments in Vellore, Ambur and Gudiyattam, will go ahead as scheduled. Income Tax sleuths last week said they found cash believed to be worth Rs 11.53 crore concealed in a cement godown belonging to an associate of a DMK leader in Vellore district. The DMK has, however, maintained that the raids were politically motivated. Party treasurer Durai Murugan even approached the Madras High Court on Monday and said that because of the ongoing raids, his son Kathir Anand who is the DMK candidate from Vellore district has not been able to campaign. The polls will now have to be rescheduled for a later day. President Kovind Accepts EC Recommendation to Cancel Election | Election in Tamil Nadu's Vellore constituency stands cancelled after President Ram Nath Kovind accepted the Election Commission recommendation. The poll body had suggested that the election in the constituency be scrapped over excessive use of money power, days after a large sum of cash was reportedly seized from the warehouse of a DMK candidate. Oppn Only Want One Thing, to Remove Me, Says PM Modi | PM Narendra Modi is addressing a rally in Odisha's Bhubaneswar city. "This opposition party only wants one thing - Modi Hatao. This is the reason why Congress and their friends have lost their credibility." He is My Guardian: Tejashwi Yadav on Tej Pratap | Meanwhile, Rashtriya Janata Dal leader Tejashwi Pratap says that there is no bad blood between him and his brother Tej Pratap. "We are together. There are no differences between us," he says adding,"Tej Pratap is my guardian." The feud between the two brothers is said to have jeopardised the party's poll prospects. A few weeks back, Lalu Prasad's older son, Tej, even quit a party post as reports indicated that he was unhappy with his powers in the party. In a shocking incident, Rohit Shekhar Tiwari, son of former Uttar Pradesh and Uttarakhand CM the late N D Tiwari, was brought dead to Max Saket hospital after succumbing to a heart attack. The Election Commission of India has sought a report from the district magistrate of Katihar ion Bihar after Congress leader Navjot Singh Sidhu appealed to Muslims not to vote for the BJP. An FIR has been registered against Himachal Pradesh BJP chief Satpal Satti for using an expletive against Congress president Rahul Gandhi while campaigning in Shimla yesterday. Satti had made the derogatory remarks while defending Prime Minister Narendra Modi against the Congress leader’s ‘Chowkidar Chor Hai’ remark. The Congress had filed a complaint with the Election Commission against Satti and demanded an apology from him. The BJP leader, however, had refused to tender an apology, saying he merely read out the contents of a message which was already viral on social media. "The person who used the derogatory word and made such a message viral cannot be our worker. Even then I asked my workers to restrain from using such remark or sharing such messages," he said.